A decade after REDD appeared on the international scene, mechanisms to reduce emissions by protecting forests–activities referred to as REDD+–are finally moving from the idea phase to implementation. One of the more advanced REDD+ initiatives is the World Bank-led Forest Caron Partnership Facility (FCPF) Carbon Fund. 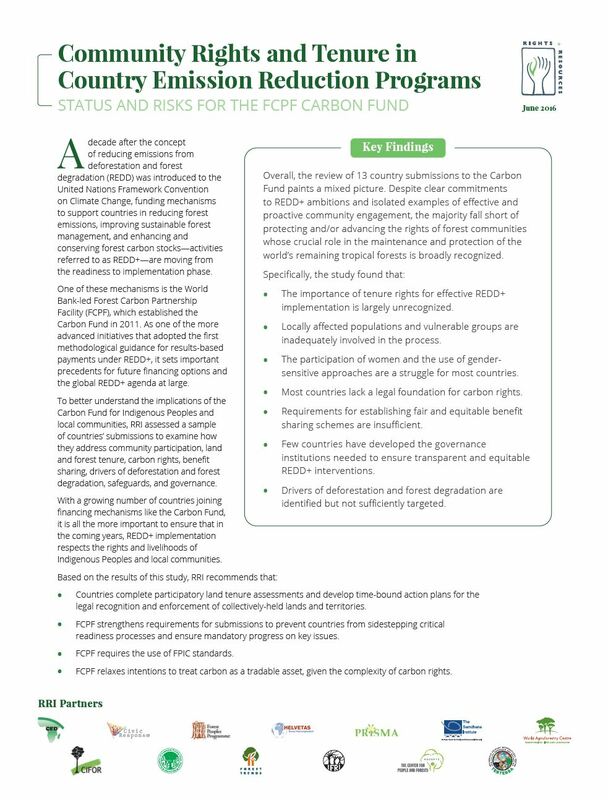 However, new research from RRI reveals that the plans submitted by governments to the Carbon Fund fall short where indigenous and community rights are concerned. The 13 submissions reviewed by RRI either fail to recognize the importance of land rights or adequately include local peoples in key decision-making processes. In fact, the World Bank’s requirements themselves fail to prioritize these rights. The full report, the analytical framework used to conduct the assessment, the individual country assessments, the review of the Methodological Framework, and full citations can be found here.